Researchers at Indiana University on Wednesday released the results of an intensive study that analyzed 10 years of hospital data for injuries from trampoline-related accidents, which found that as many as one million ER visits each year are related to injuries involving trampolines. 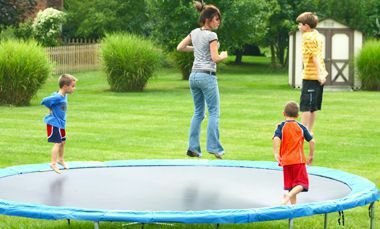 Dr. Randall Loder, who is the chair of orthopedic surgery at the Indiana University School of Medicine and the lead author of the study, analyzed U.S. hospital data and found that almost 289,000 emergency room visits for broken bones alone between 2002 and 2011 can be attributed to trampoline-related accidents. And that’s just broken bones – in all, Loder estimates that all trampoline-related accidents led to approximately 1 million emergency room visits during that period. According to the study, the total cost of these ER trips exceeded $1 billion. Loder claims that he noticed a sharp increase in the number of patients with bone fractures who claimed to have suffered the injuries in accidents on backyard trampolines, specifically. What’s interesting about Loder’s study is that it only included data involving injuries that were reportedly suffered in accidents involving a home or backyard trampoline and not trampoline parks. Back in 2012, the U.S. media collectively reported on a so-called epidemic of child injuries at trampoline parks – which are typically large warehouses or other buildings converted into a full-scale indoor trampoline facility – across the country that made consumer safety advocates question the overall safety of trampolines in general. At the time, the business of transforming industrial warehouses into full-scale trampoline parks was booming and a number of them continued popping up throughout Washington state. And just as news started to spread about the safety risks associated with these attractions, it was reported that at least 18 families in the Seattle Metro area had filed negligence claims against a Bellevue-based trampoline park. That particular trampoline park – called Sky High Sports in Bellevue – filed for Chapter 11 bankruptcy in January 2013 after becoming the target of dozens of personal injury lawsuits stemming from children who were seriously injured at the facility. The company has since closed down despite several pending lawsuits. In the study, Dr. Loder indicated that the number of reported injuries from backyard trampoline accidents peaked at an estimated 110,000 in 2004. The response to the peak in accidents led to sweeping changes in regulation and safety improvements, including the introduction of safety net enclosures that are now standard on trampolines. It’s presumable that these changes in safety standards have contributed significantly to the decrease in the number of trampoline-related injuries that are reported on an annual basis, but safety advocates say there’s no reason to celebrate just yet. In Loder’s report, he stated that elbow fractures and knee fractures are the most common types of injuries stemming from backyard trampoline accidents. These injuries are particularly troubling when it comes to children because they can affect growth plates and cause long-term issues, and sometimes even require corrective surgery that can be quite costly.